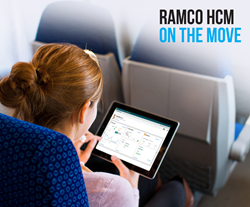 Ramco HCM on the move! Ramco Systems, a leading enterprise software provider on Cloud, Mobile and Tablets, today announced the launch of its HCM (Human Capital Management) offering for the US market, at the HR Tech Show 2015, in Las Vegas. HUB: Designed for a role, HUB helps the user visualize, transact, and gain actionable Insights pertaining to the users’ role all from a single screen. Ramco Systems was cited as a “Sample Vendor” for HRMS via SaaS and Mobile HCM in Gartner’s Hype Cycle for Human Capital Management Software, 2015. Mr. Ron Hanscome, Research VP, Gartner Inc., adds “We continue to see a growing number of organizations of all sizes switch to cloud-based HCM offerings versus choosing to continue to invest in their existing on-premises applications. We have seen an increase in Gartner inquiries from customers who seek a more integrated approach, especially around the talent suite, and we are beginning to see a growing number of organizations that are evaluating a more unified core HRMS and talent strategy”. Ramco HCM has been lauded by customers and industry experts for its ‘Cool’, user-defined interface and its ability to automate and aid in making smart decisions. The HCM offering is led by a Global Payroll solution, which adds to the strength of Ramco’s innovative offerings in the disruptive era. Notably, Ramco’s Global Payroll is compliant across 35+ countries. The company recently raised around USD 52mn from Institutional investors like HDFC Mutual Fund, Amansa Holdings, Goldman Sachs, Jo Hambro, Axis MF among others to fuel its global expansion plans. For the financial year ending March 2015, Ramco HCM recorded growth of 113% YoY garnering good traction from International markets. Multi-country Payroll, Mobility, and Intuitive user experience are driving the product to add on an average 1 new customer a week. With a comprehensive coverage of APAC, Middle East and Australia, Ramco Global Payroll covers countries such as Hong Kong, Philippines, Thailand, Indonesia, Singapore, Malaysia, Vietnam, India among others in APAC; all of GCC and Egypt, Nigeria, Ghana, Sudan, Republic of S. Africa, in Middle East-Africa; Australia, New Zealand, United States and UK. Ramco is now poised for rapid growth as duly acknowledged as a Leader in NelsonHall’s NEAT report. Ramco Systems is part of the USD 1 Billion diversified conglomerate, the Ramco Group of companies. Ramco Systems is a rapidly growing cloud enterprise software company focused on providing multi-tenanted enterprise software to corporates in the area of HCM and Payroll, ERP and M&E MRO for Aviation, with Mobile first philosophy and In-memory based Planning and Optimization engine. At Ramco, we understand that functionality alone cannot help a product succeed in today’s crowded marketplace. With utmost importance to usability, Ramco has charted out a product philosophy of MUSIC—an acronym for Mobility, User Interface, Social, In-Memory and Context-aware applications. Headquartered in Chennai (India), the company has 20 offices spread across India, USA, Canada, Europe, Australia, Middle East, South Africa and APAC.